Wine jelly is one of the prettiest, lightest, and easiest desserts you can make. After the wine has set, chop it into cubes and slivers so that the pieces sparkle. 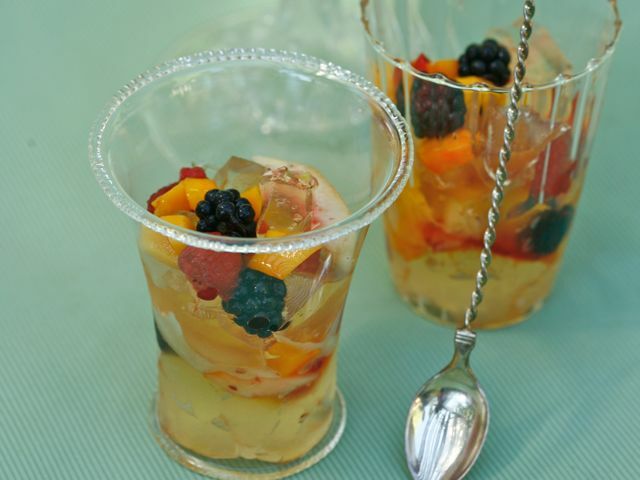 Then serve the broken jelly in wine glasses with summer fruit. For the wine you can use Marsala, sherry, Riesling, or a sparkler like Champagne or Moscato d'Asti. I'm especially fond of the latter. It's bubbly and aromatic, plus you'll have extra to pour over the jelly or drink alongside. For fruit, choose those that are ripe and full of flavor — white peaches or nectarines, raspberries, or an aromatic melon. Slice those that need to be sliced into bite-sized pieces as close to serving as possible. Don't hesitate to mix fruits. White peaches and raspberries are always perfect together. Sprinkle the gelatin over ¼ cup cold water and set it aside to soften. Combine the sugar with the ½ cup of the wine in a saucepan. Bring to a boil, then simmer, stirring occasionally, until the sugar is dissolved. Remove from the heat, and stir in the softened gelatin. Stir until it’s thoroughly dissolved, then pour it into the rest of the wine along with the lemon juice. Mix well, then pour into a bowl or a compote dish and refrigerate until set. Wine seems to take longer to set than cream or fruit juices, so plan on at least 6 hours, or even overnight for a firm set. Chop the jelly into cubes, then serve it in the compote, or in wine or Champagne glasses interspersed with the fruit.